There once was a time when we couldn’t tell a baby’s gender until he or she arrived on the scene. Now, we can find out as early as 12 weeks into a pregnancy with a quick visit to the doctor. And who knows, in the future, you might pee on a stick and have it turn pink or blue and tell you the gender as soon as you know you’re pregnant. 1. Cakes, Cupcakes & Cookies… yum! Throwing a gender reveal party is a common way to get everyone together and tell them all at once, but once you have them there, don’t just stand on a table and tell them – take it a step further. Bake a cake and add blue or pink food coloring to the batter. Ice it with white icing or some other neutral color. Once you slice into the cake, everyone will know. You could also do the same thing with cupcakes – and only change the color of one cupcake. The person who finds the pink or blue cupcake gets to make the announcement! You could also have a prize for the “winner”. Like cookies? 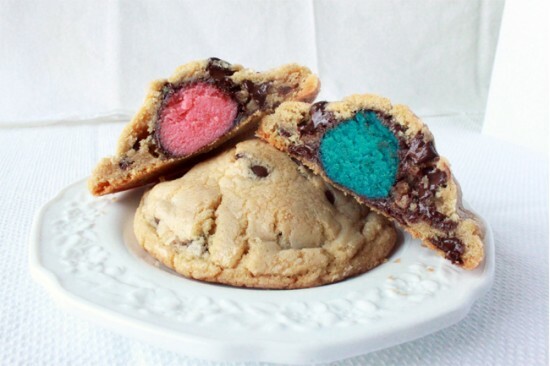 Try this cool chocolate chip cookie idea. Similar to the cake idea, you could also buy a baby themed piñata for your gender reveal party and fill it completely with blue or pink goodies. Even without a large party, you could reveal the gender to a small group with balloons in various ways. Get black balloons (commonly used for the Over the Hill parties), fill them with helium and pink or blue confetti. Let kids or a special guest pop them for an explosive reveal. If you are having a large party, give everyone a balloon and pop them all after a big count-down. If you’re not into such a loud scene take pink or blue balloons, fill them with helium and wrap up in a package for one special person to open. If you’re comfortable making your own cards, you can buy scratch off paint online. Make cards that can be given out at a party or a card that can be mailed to family. When they scratch off the area painted over with the scratch-off paint, the gender is revealed! So you already have at least one child? 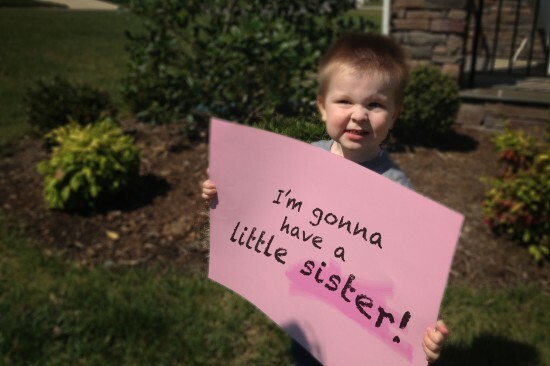 Get the Big-brother-to-be in on the excitement. You could take a photo of them in a shirt or holding up a card with the news. Send the photo out by email, put it in a real card to mail out, or simply post it to Facebook. Everyone loves photographs and this is a moment you’ll want to remember. Why not take a photo that announces the gender in a creative way? 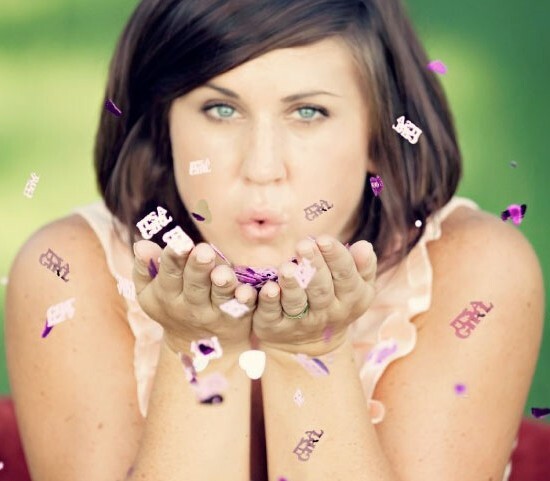 Like the photo above you could blow some boy or girl confetti into the camera. Or, grab your partner and hold up a sign together. Do you have the board game Scrabble? Hold the letters spelling “boy” or “girl” in your hand near your belly. 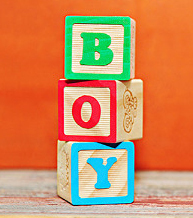 If you’re having friends or family over, stack some blocks spelling out “boy” or “girl” and put it in a place you know it will be seen… then wait for them to notice. Or, if you have a wall clock or something else round on the wall, turn it into a male or female symbol with some blue or pink construction paper. So we’ve listed quite a few different ideas with plenty of variations. Why not make it a big event and throw a Team Blue/Pink party? Have your friends and family come visit and wear pink or blue to show their guess. Got other ideas that aren’t listed here? Leave it in the comments and we’ll add it to our list. There are already gender reveal pee tests!! I know they sell them at Walgreens but no idea how accurate they are.